Are you looking for a secluded getaway that is located just outside of Bryan/College Station? Look no further! 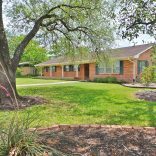 Rustic Retreat is a luxurious escape on six acres of land is only 12 miles from the heart of College Station and four short miles from the Messina Hof Winery. Rustic Retreat is great for game day weekends, parents weekend or just a weekend in the country! Rustic Retreat offers a place for families and friends to retreat from the hustle and bustle of the city and enjoy the stillness of the great outdoors! Come on out and enjoy roasting marshmallows out by the fire or cooking your favorite food on the grill out back. 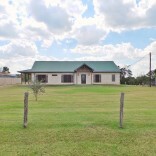 Whether you desire to stay indoors or outdoors, this property has all your essential needs. 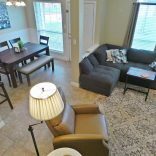 From the fully equipped kitchen with granite countertops and all stainless steal appliances, to the beautifully decorated and fully furnished rooms, this property is sure to make you feel right at home! Enjoy the front or back porch while sipping your favorite beverage. 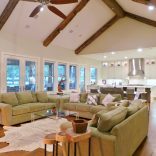 Rustic Retreat includes 5 bedrooms and 4 full baths to comfortably accommodate all guests. 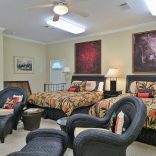 Complete with a 50-inch TV in the main living area for company to enjoy their favorite movie before they retreat to their comfy rooms. What are you waiting for?